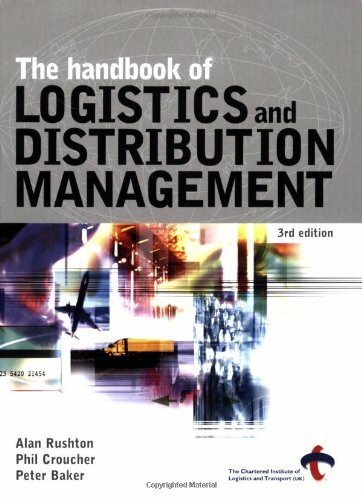 This third edition includes updates in manufacturing logistics, integrated logistics, process design and home delivery and brand new sections on warehouse receipt and dispatch. Also contains an thorough explanation of new technologies such as radio frequency identification (RFID), voice technology, satellite crane systems and dynamic pick systems. Phil Croucher is an independent consultant and lecturer with over forty years experience in the Logistics and Supply Chain Industry. Over the years he has held many senior posts in the industry and worked in countries such as Oman, UAE, KSA, Jordan, Algeria, China and India. He is a Fellow of the Chartered Institute of Logistics and Transport and has an MSc from Cranfield University. He teaches at the University of East Anglia on a regular basis as well as undertaking foreign assignments for CILT to places such as Somalia and Thailand. War, Hurricane Katrina and the Supreme Court nomination fights. Baker is the author of many NYT bestselling books: The Breach: Inside the Impeachment and Trial of William Jefferson Clinton, Kremlin Rising: Vladimir Putinï¿½s Russia and the End of Revolution, and Days of Fire: Bush and Cheney in the White House. He won the Gerald R. Ford Prize for Distinguished Coverage of the Presidency for his reporting on Bush. Baker is a regular panelist on PBSï¿½s Washington Week and a frequent guest on other television and radio programs. Third party or own account? Why should an organization engage in benchmarking?